It's hard to believe, it's already almost the end of December and the end of the year. The weather is relatively cold and dry with not much rain here in Northern California. There are still some red, yellow and orange leaves on some trees, a bit of autumn so close to the Winter Solstice and Christmas. 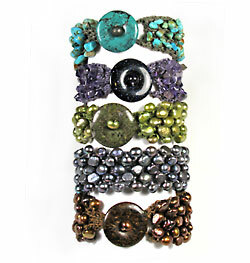 Still looking for a last minute gift, today is the last day for First Class mail for Christmas arrival. December 21is the last day for Priority Mail orders and December 22 or 23 is the last day for Express Mail for Christmas arrivals depending on location. To check transit time, go to the USPS Postage Calculator and enter 94062 as the departing zip code. All the ribbon are hand dyed one skein at a time. 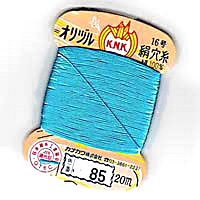 The rayon ribbon is dyed by an artist in New York State. 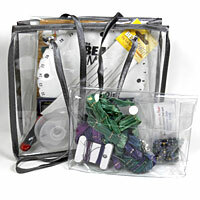 The nylon ribbon is limited to stock on hand as it was a one time project by a yarn producer in New Mexico. 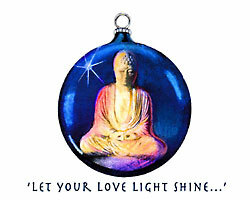 December 6, 2011 - Need Ideas for Gifts ? 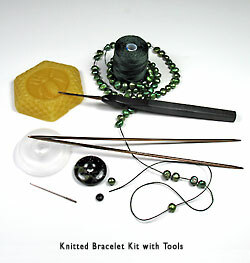 Order a special gift, such as a Knit Bracelet Kit for someone who likes knitting, a Crochet Starter Jig Kit, or a Ribbon & Bead Kumihimo Kit. For stocking stuffers check out tools, such as a thread burner, gold plated scissors or get a collection of thread & cord for someone on your list. 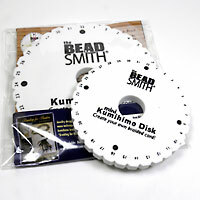 For kids, get a Mini Kumihimo Kit with a few spools of C-Lon Bead Cord Tex 400. 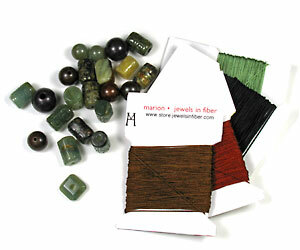 Go to marion jewels in fiber gallery for a special gift and ready to wear jewelry. We will even gift wrap for you. 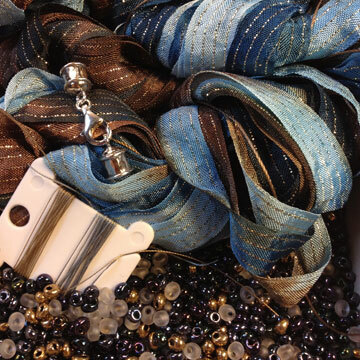 Please add your gift wrap request at checkout! I have been playing with leather wrapped bracelet for a while using mostly 1.5 mm Greek leather in natural, brown and black leather. I decided to experiment and expand by adding new colors... As to cords, I like C-Lon Bead Thread Size D and AA when I want to minimize the cord as it flattens against the leather. 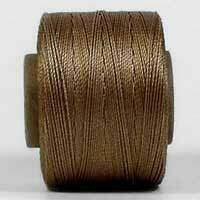 I also like using C-Lon Micro Cord and C-Lon Fine Weight Bead Cord Tex135. Sometimes I like the color of the cord to match the leather blending in, other times I like contrast. New Size: 1mm Black Cord for Taiwan, similar in cord quality to the Black Extra Fine. Chinese Knotting Cord is HOT right now. 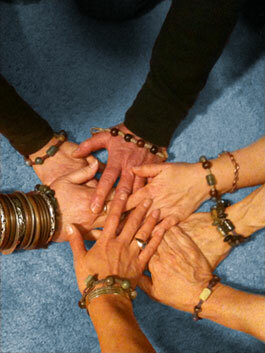 Everyone is making square knots bracelets with beads. Based on traditional Chinese bracelets, the newest renditions of these bracelets are often called Shamballa or Disco Ball bracelets. Easy to make and fun to wear, try your own version. 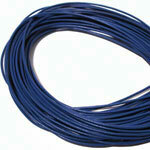 Larger cord such as the Medium Size is great for 10-12mm Beads, finer sizes for smaller beads. Bracelets can be made with a combination of sizes as well, one size for the knotting cord, another for the cord going through the beads. As to beads you can include anything your heart desires and budget allows, from plastic beads to black onyx with diamonds, including some of newer bead cuts in the shape of soccer balls! 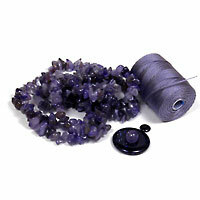 Many of my customers are new to skeins. 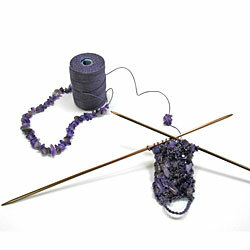 Not knowing how to deal with skeins can be a great source of frustration. 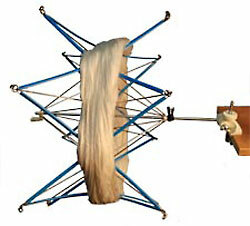 An umbrella swift skein winder is a great tool, but not mandatory. Here in my studio, we do use one to transfer Chinese Knotting Cord from skein to cards, but for just a few skeins, a friend arms or the back of a chair will work just as well. September 7, 2011 - Over 50 Colors of Kanagawa Added! Many of the 'newly returned' colors are some of my favorites... It is a treat to have them back in my studio and know I can get more. It is so hard to work with a color when it is the last card available... I spend some time adding all the new colors on the website and playing musical chair with the color chart. Many of the jpegs were adjusted to make is easier to order without a color card! 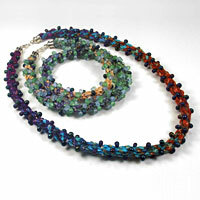 Last summer I played around with Kumihimo braids, beautiful hand dyed ribbon & beads. Egg-shaped wooden handle designed to fit comfortably into the palm of the hand. Comes with 6 interchangeable crochet shafts. 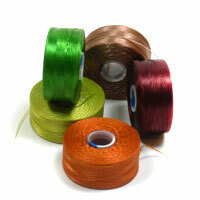 The C-Lon Bead Thread Size AA is now available by single spools and collections. 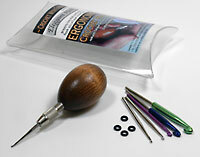 C-Lon started out producing the C-Lon Bead Thread in Size D & AA out of sense of frustration with the lack of high quality thread for working seed beads. 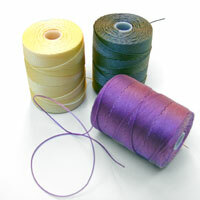 They added bonded nylon cord, starting with the standard size most often used for micro macrame. I found C-Lon and the C-Lon Bead Cord in 2005. 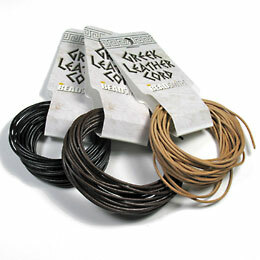 At the time they produced 24 colors of C-Lon Bead Cord. Since then they have added lots of new colors and sizes. 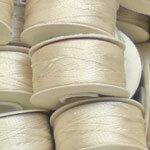 Chinese Knotting Cord - NEW SIZES! 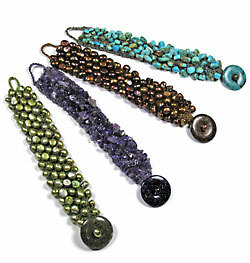 Chinese Knotting Cord is hard to get in many colors and sizes. Dependable supply is hard to find. Dye lot variations are so large at times that they create brand new colors. These hurdles can be overcome with proper planning and overlooked as this material is unique. It is the best cord for many kinds of projects. The braided nylon cord is fusible, so the ends can be burnt. 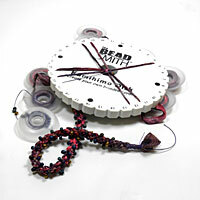 It is durable and it has just enough grip and body to knot well. 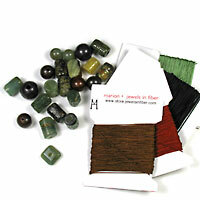 It is the best choice for many types of Chinese and Asian knotting and for 'Shambala' square knot bracelets. 18 colors of Medium, 18 colors of Fine, 8 colors of Extra Fine and 3 sizes of Micro with 53 colors in the Size G, 11 colors of Size F and 3 colors of Size E.